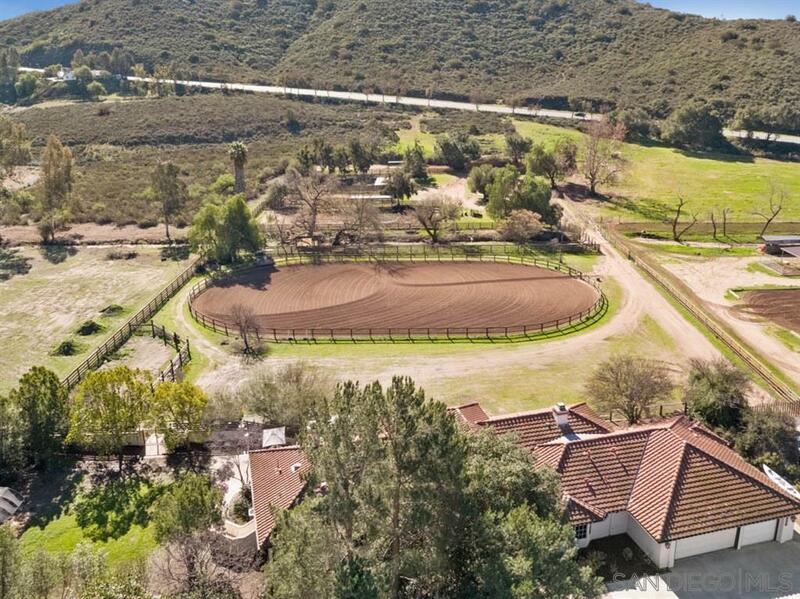 Enjoy the âCity in the Countryâ lifestyle Poway provides in this spacious horse property. With a 5.32-acre flat and usable parcel, there are accommodations for many horses, including a 6 stall barn w/ tack and storage areas, 5 paddocks with shelters, an exceptionally large riding arena and direct trail access. Bring your chickens, ducks or goats, too. Located within walking distance to town and school, this 3,255 sq. ft. ranch style home features vaulted ceilings, large, bright windows and scenic views., The 4 bedroom, 3 bath home has a versatile and spacious floor plan. Two (wood burning or gas) fireplaces warm the living and family rooms. The spacious en suite master bedroom has large windows with views of the horses, arena, and surrounding trees and vegetation, while the large bathroom offers ample storage space, his/her sinks and closets. The sizable laundry room has built-in cabinets, sink, and windows. The property is served by the highly regarded Poway Unified School District which includes Tierra Bonita Elementary, Twin Peaks Middle, and Poway High, each with a record of high performance. Poway, with a population of nearly 60,000, is home to many former sports legends, musicians, politicians, and actors. Family activities abound, including Concerts in the Park, Movies in the Park, Old-Fashioned Fourth of July, Christmas in the Park, and the Winter Festival. Easy access to I-15 and Highway 67.